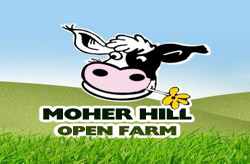 Moher Hill Open Farm and Leisure Park is situated overlooking Liscannor Bay and is much more than a fun family filled day out. This 14 acre open farm ensures that children and adults alike have an opportunity to learn about and interact with their favourite animals in breathtaking surroundings. The farm has a wide range of activities to ensure that all ages are kept entertained, regardless of the weather with bouncing castle, in-door and out-door go karts, ball pool, all weather out-door play area and miniature golf course. Sorry there is currently no listings for Liscannor.